Many attacks and robberies can happen around a car. With several decades in martial arts/Krav Maga, quite a few decades living in this world, and traveling around the world teaching self defense, I am exposed to a lot of crime and a lot of ideas. I will try to share some here. First, as much as we like to believe that the world is all sunshine, peaches and cream, oh what a wonderful world it is, we must recognize the reality of crime and violence. In the few minutes that I have been working on this article some terrible crimes have taken place. No, I have not been listening to the news but based on crime statistics it is safe to say that in the last few minutes some place around the world several people have been killed, women have been raped, children have been abducted. Violent home break-ins have taken place, people have been robbed, mugged, drugged and even had their internal organs stolen. Yes, what a wonderful world indeed. 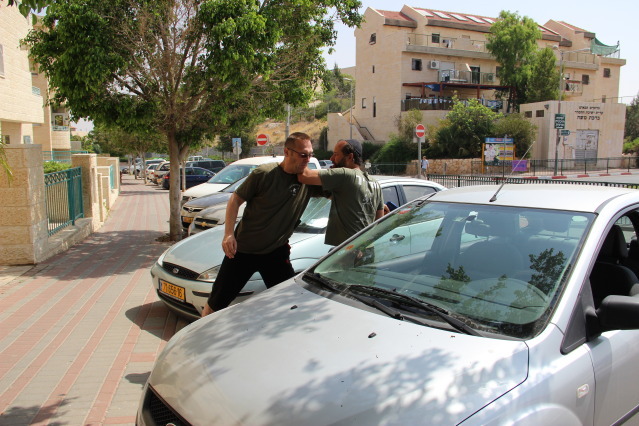 The physical part of Krav Maga; our defenses against kicks and punches, knives and guns, is always the last resort and not even necessarily the most important part of self defense. The "cool" stuff is preceded by a lot of boring stuff that is vitally important. But first, the very first point of self defense is awareness, and this begins with a reluctant admission that we are not safe. I say reluctant because we all want to be happy and no one wants to focus on the sad and bad stuff. We don't want to hear the stories cops have to tell. We find it too depressing. However, if we are to take our self protection seriously that we must have an idea of what is out there, what dangers are lurking. You see, as we speak someone is planning to hack your bank account, or abduct your child, or rob you at the ATM, or steal your car, or a thousand other ideas. There are people who do this professionally and they work hard for your money. You cannot defend against a danger you are unaware of. Hotels - You can save money by staying in a cheap hotel but it may end up costing you. When I stay at the Hilton I know that it is very difficult for anyone to get to my room, let alone get inside it. And I know the screening process it takes to get hired at the Hilton. However if you stay at Moe's road side motel, well that is a different story. What you saved on staying at a lesser hotel you may lose in other ways. Your door is not secure. Anyone can walk up to your door anytime, day or night. The people that work there are often less reliable. You get what you pay for. Personally I would not feel secure leaving my chewing gum in the room, let alone my passport or cash. Criminals know that people on vacation or on business trips carry cash and valuables. They watch the hotels and the people who come and go. The Home - The home is supposed to be your safe zone but it is not safe enough. There are two types of dangers; yourself and your possessions. Home invasion is an entire topic unto itself that must be studied carefully. You should consult with a professional and find the correct choice of security cameras, sensor lights, possibly barbed wire, fences, safes and so forth. You should also work out a plan for resistance and escape based on the layout of the house. This means do not create a temptation for someone that he may not be able to resist. Someone may not be planning to rob you but if they see some cash or other valuable objects lying around they may be tempted. They will rationalize that you can easily recover from the loss but they really need it now to get out of a bind. Don't create this temptation. Never leave anything of value lying around. If you must keep valuables in the house research correct methods to hide these objects, credit cards or cash. You might leave an envelope on a desk labeled "Rend money" or "Car down-payment". That is just too much temptation for a guest. Be smart! In Public - There are certain areas where criminals know that money is likely to be found. If you are walking into a bank, Western Union, ATM, etc it is likely that you will have money either coming or going out. As such you must be super careful. Chose the time of day carefully. Chose the location carefully. Try not to be alone. Keep the money out of sight. Act natural. And most important keep your eyes open. If you see some shady looking characters lurking around, head back into the bank and wait it out or call for assistance. Public Transportation - This is another area where people are likely to have cash. Be careful. I have heard many stories about people falling asleep and waking up without their wallets. In some cases the wallet may have fallen out of their pocket while sleeping. Chose your clothing carefully. Some pockets are great for when you are standing but when you are leaning back you will soon find all your change falling out, and in some cases even a wallet can fall out. Chose the location of your money carefully. Never leave it in a bag. It is much easier to steal a bag then it is to get money off the person themselves. Keep in your money in your front pockets where it is much more difficult for a pick pocketer to take it. If possible choose clothing with a pocket that has a zipper or a button, anything to make it more difficult for someone to take it away without you noticing. While walking keep an eye on your pockets, keep your hands close to your cash, phone, or wallet. And keep your eyes on those around and try to maintain a safe personal space. Public Parking Areas- These can be particularly dangerous, these are hot spots for potential crimes. Anything on your body - Expensive clothing, jackets, wallet, jewelry, cash, credit cards etc. Anything you are carrying - Expensive hand bag and its contents, your recent shopping. The Criminals will be waiting patiently for your return, or for the next available target. They will look for people who are distracted, looking for their keys or talking on the phone; these people make great victims. Tricks - The criminals also have a variety of tricks at their disposal. One trick is to tie a few empty coca cola cans to the back of the car. As the driver starts to drive he/she will hear the sound, think that something got attached accidently and might stop the car, leave the motor running, and go out for a quick look. At this point the ready criminal runs in and drives off. Another trick is to leave a piece of paper on the back window. The driver will notice the annoying obstruction and after starting the car and looking out the back window, get out to remove the piece of paper. At this point the ready criminal jumps in and takes off with the car. Cell Phones - Cell phones are often and easily robbed. What your phone contains is usually far more valuable than the phone itself. You might be giving the criminal access to your most valued possessions. You must be careful. Avoid being robbed - Many young women have their phones sticking out of their back pockets, almost asking to be robbed. Hide your phone on you. Keep your phone safe in a deep pocket. Never hold it out to text in public, this exposes you as a great victim. If you must text find a safe quiet spot away from the public view, perhaps in a toilet. Find a spot where you can see any approaching individuals and remember to focus on all that is around you. All too often people become obsessed with their text message, it is very easy for a passer-by to just grab the phone out of your hand. Information - Be careful with the information on your phone, always keep in mind that this might fall into the hands of the wrong person. Use codes: instead of Husband, home, Mom and Dad, find other terms. Be careful about bank codes or other access codes. Never use Bank, or Password. Find some other terms that only one understand.